World-renowned canopy biologist Nalini Nadkarni has climbed trees on four continents with scientists, students, artists, clergymen, musicians, activists, loggers, legislators, and Inuits, gathering diverse perspectives. In Between Earth and Sky, a rich tapestry of personal stories, information, art, and photography, she becomes our captivating guide to the leafy wilderness above our heads. 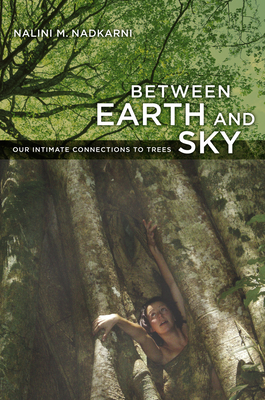 Through her luminous narrative, we embark on a multifaceted exploration of trees that illuminates the profound connections we have with them, the dazzling array of goods and services they provide, and the powerful lessons they hold for us. Nadkarni describes trees' intricate root systems, their highly evolved and still not completely understood canopies, their role in commerce and medicine, their existence in city centers and in extreme habitats of mountaintops and deserts, and their important place in folklore and the arts. She explains tree fundamentals and considers the symbolic role they have assumed in culture and religion. In a book that reawakens our sense of wonder at the fascinating world of trees, we ultimately find entry to the entire natural world and rediscover our own place in it. Nalini Nadkarni is the author of Rainforests, with J. Johnson, Monteverde: The Ecology and Conservation of a Tropical Cloud Forest, with N.T. Wheelwright, and Forest Canopies, with M.L. Lowman. She teaches in the Environmental Studies Program at The Evergreen State College and is President of the International Canopy Network. Her work has been featured in magazines such as Natural History, Glamour, and National Geographic and she has appeared in numerous television documentaries. In 2002, she received a Guggenheim Fellowship to better extend her work to the public. Nalini Nadkarni is the 2010 recipient of the National Science Board Public Service Award, presented annually to an individual who has made significant contributions in public understanding of science in the United States.